AFP – President Emmanuel Macron will separately meet his US and Iranian counterparts, Donald Trump and Hassan Rouhani, during the UN General Assembly in New York next week, the French presidency said Wednesday. The meetings come as Macron and other European leaders try to salvage a landmark 2015 accord to curb Tehran’s nuclear programme, which Trump pulled the US out of last May. The 40-year-old French leader will meet Trump on Monday afternoon before having dinner with UN Secretary General Antonio Guterres. 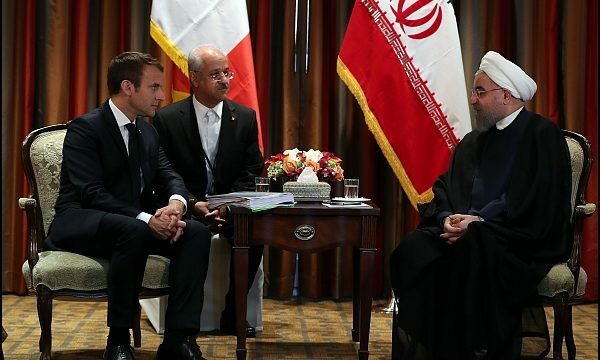 On Tuesday, the French president will address the assembly and hold talks with Rouhani, an Elysee Palace official said. Trump has signalled that he might be willing to meet with Rouhani as well, after re-imposing sanctions against Iran last month. A new round of even harsher sanctions is set to go into effect in November targeting Iran’s vital oil sector. The Elysee official said the US strategy on Iran would be high on the agenda. The US sanctions have hit Iran’s economy hard since foreign companies can no longer operate in the country without running the risk of being hit by US penalties. However US Secretary of State Mike Pompeo said last week that Washington was still considering offering waivers for certain countries or businesses once the new sanctions are imposed. The US accuses Iran of destabilising the Middle East by pursuing missile development and its intervention in conflicts in neighbouring countries including Syria and Yemen. Iranian officials have repeatedly indicated they have no plans to hold talks with Trump when the general debate opens at the assembly on Tuesday, nor re-negotiate the 2015 deal which saw Tehran commit to renouncing its nuclear weapon ambitions. Macron claims friendship and a good working relationship with Trump, though he has not been able to convince the US leader to stick with the hard-fought nuclear deal, also signed by Britain, France, Germany, Russia, China and the EU. The French leader has also failed to avert Trump’s launching of a trade war with the EU, imposing tariffs on a range of products to retaliate for what he calls “unfair” dealings.